Last month, Modern Family star Sarah Hyland opened up about a disheartening side effect of taking medication for her battle with kidney dysplasia: hair loss. Although this is a very singular, specific case, thinning hair isn’t something that’s exclusive to people grappling with chronic illnesses. We all deal with it to varying degrees, be it through genetics or the way we treat our hair on a day-to-day basis. And because we wouldn’t want anyone to misdiagnose themselves, we reached out to Michelle Blaisure, certified trichologist for Bosley Professional Strength Hair Care, who gave us a crash course on everything from the main causes to simple, yet effective forms of prevention. According to Blaisure, the main and most common cause of hair thinning, also known as male or female pattern baldness, is genetic predisposition. In simpler terms, that means you can inherit genes from your mother and father that make it nearly impossible to avoid. “About 60 to 70 percent of men will thin by age 60 and 20 percent of women inherit [it] as well, but with women, we seem to be prone to hair loss due to many things that can affect our hormonal and biochemical balance,” she says. Excess hair shedding is often one of the first signs that something is out of balance. And if you’re constantly over-manipulating your strands with tight ponytails or other protective styles (braids, weaves, buns), you’re making yourself more susceptible to hair thinning as well. Genetic thinning: This means you have inherited a sensitivity to the hormone dihydrotestosterone. DHT causes the hair to get smaller and thinner. Men usually thin or go completely bald in the crown and hairline areas, while women tend to just get really thin. In both cases, you’re likely to experience micro-inflammation (swelling, redness, irritation) in the hair follicles. Thyroid malfunction: Hair loss can also be a sign that your thyroid, a large gland that lives in the neck and secretes the hormones that maintain our body’s metabolism, is producing a low level of those hormones. This in turn causes dry, brittle hair and excessive shedding. On the other hand, a hyperthyroid, or one that secretes an excess of metabolic hormones, can cause hair loss and an oily scalp. Inadequate protein intake: Blaisure says this is common in vegans due to lack of vitamin B12, which comes from animal sources. “Plant proteins do not provide B12 and must be combined in order for the body to properly utilize all the amino acids it needs for optimal function, and eating too much protein and not enough carbs can cause hair to shed as well,” she says. Autoimmune disorders: Inflammation is the common thread between a slew of disorders that can cause the hair to fall out. Blaisure says the most common ones are diabetes Type 2 (in which the body can no longer manage blood sugar levels), lupus (in which the body attacks its own tissue and organs) and polycystic syndrome (in which elevated male hormones are causing an imbalance). 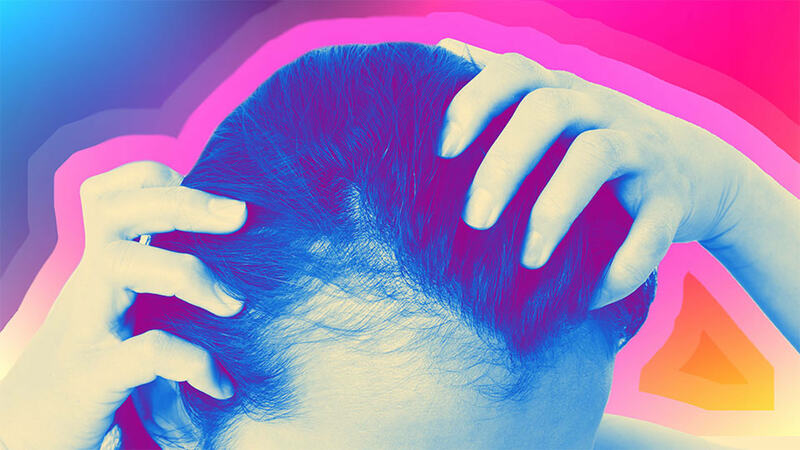 You’ve also probably heard of alopecia areata, an autoimmune disorder that causes inflammation in the hair follicle as the body attacks the hair cells. Blaisure says this usually shows itself in the form of bald patches, and in some cases can become more acute, leading to alopecia totalis (loss of head and facial hair) and universalis, with total body hair loss. Other hair- and scalp-specific causes of inflammation in the scalp and on the skin are seborrhea, psoriasis and folliculitis (inflammation of the hair follicle). While some disorders require more aggressive treatment, such as therapies or prescription medication, there are ways to lessen your chances of hair thinning through simple lifestyle changes, the most important being your diet. “We are learning more and more about the importance of a healthy gut, as the gut is the seat of about 70 percent of our immunity, so eating a variety of nutrient-rich foods, such as probiotics, vegetables and healthy fats to help populate the gut with good microbes is really the key to optimal health, which includes your hair health,” says Blaisure. Specifically, you should be reducing the sugar and processed foods in your diet. Blaisure always recommends the foolproof 20/80 rule, which means you should consume the healthy stuff 80 percent of the time so your body can handle the devitalized foods (processed and fast foods), the other 20 percent. If you want a more specific starting point, try eating wild-caught salmon and/or grass-fed beef at least once or twice a week to get good omega-3 fatty acids in your diet. If you’re vegetarian, get the same level of nutrients through flaxseed or fish oil supplements. Here’s yet another reminder that a good night’s sleep does wonders for the body overall, including healthy hair growth. Most of us need 7 to 8 hours to feel well rested. Your hair is less likely to break, shed and thin out if you’re simply gentler with it. Give it a rest from extensions, tight ponytails, braids and weaves periodically. If you’re doing this around the clock, the chances of permanent loss become greater. And regardless of your hair texture, Blaisure says you should shampoo at least once or more a week, “as the scalp’s microbiome can get out of balance and that is when we start seeing more scalp disorders.” After consulting with an expert stylist or learning more about the traits of your specific hair type, look for products that contain strengthening ingredients for keeping your strands in check. Also use a good multivitamin, like Bosley’s Vitality Supplement with horsetail extract, to make sure you are getting the right balance of vitamins and minerals, such as your B12 and D (which many people are low in) along with zinc and magnesium. Lastly, if your hair loss goes beyond the normal level of shedding and you can easily detect a thinner ponytail or exposed skin along the hairline and/or middle of the scalp, see a professional immediately. A trichologist, like Blaisure, studies the science and function of human hair, so he or she can examine it more closely and determine whether you should be officially diagnosed with a disorder or not. From there, they can also recommend whether hair transplant surgery is necessary. Overall, a healthy lifestyle is the best way to avoid hair thinning and hair loss. But if you’re dealing with something that’s tied to an illness or your gene pool, it may be worth seeing an expert for help.